Letter to Martha Berry from Rev. 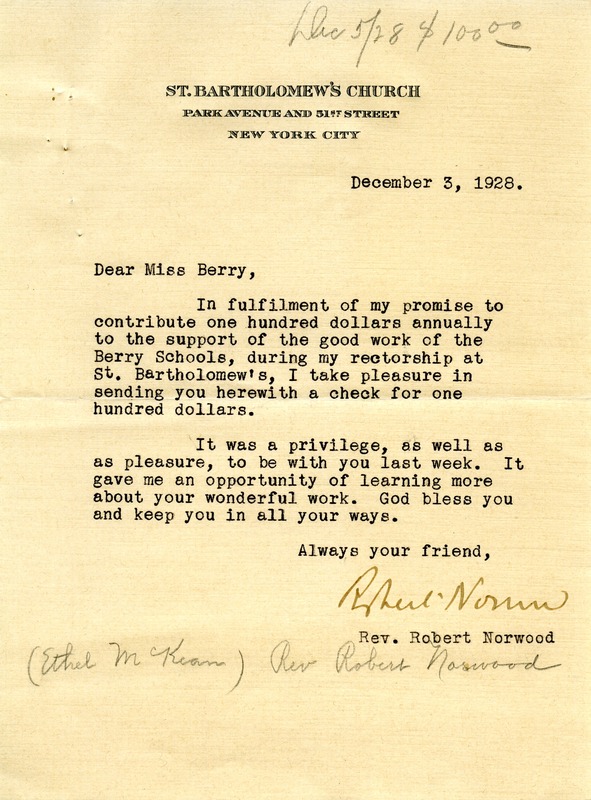 Robert Norwood informing her of his donation of $100 in order to fulfill his promise to her that every year he was in the rectorship that he would donate that amount to The Berry Schools. He informs Miss Berry that it was a pleasure to give to her good work as well as to see her the previous week to learn more about her work. He also wishes her well in the continuance of her work. Rev. Robert Norwood, “Letter to Martha Berry from Rev. Robert Norwood.” Martha Berry Digital Archive. Eds. Schlitz, Stephanie A., Haley Fortune , et al. Mount Berry: Berry College, 2012. accessed April 25, 2019, https://mbda.berry.edu/items/show/8582.